For those who are looking for a little variation in terms of instrument sounds, there's a usable but a bit hackish method you can use to achieve it without resorting to external libraries. It uses "Pitchproof" (a 64bit freeware VST plugin from Aegan Software -- http://aegeanmusic.com/pitchproof-Specs) to pitch shift notes a few steps up or down, giving the instrument a moderately variant sound by mildly fiddling with (I presume) the overtone series of the note as well as changing the phase relationship. That and some mild EQ can help to achieve what I'm finding to be a reasonably good approximation of a "different" instrument of the same type. 1) Write and create the part as you would normally in Notion. 2) When you're ready to listen back or record your piece, *transpose* the part down 4 half-steps (a major 3rd). 3) OPTIONAL: Judiciously apply some EQ. While not required, it can help "vary" the sound from the original. 4) Apply the Pitchproof plugin directly to the instrument you transposed. 5) Set the "PITCH" to +4 and set the "TRANSIENT FIX" to OFF. I recommend turning the TUNER off as well (set it to "NO DISPLAY") just to preserve CPU. 6) OPTIONAL: Set the DETUNE to a small value for additional variation (I used 0.0100). 7) Set the BLEND to 100% WET (1.000). 8) OPTIONAL: Judiciously apply further EQ. In the spirit of Surfwhammy, I've attached copious screenshots of exactly how this is achieved, as well as some light analysis of what the sound frequencies look like and an audio sample of what it sounds like (I've used a clarinet for this particular example). Admittedly, this effect is very subtle. In fact, it's probably not even noticeable in many circumstances. However, I think the same could be said of "normal" instruments as well. kmlandre wrote: In the spirit of Surfwhammy, I've attached copious screenshots of exactly how this is achieved, as well as some light analysis of what the sound frequencies look like and an audio sample of what it sounds like (I've used a clarinet for this particular example). This is an excellent extended post on so many levels that it is virtually mind-bogglingly fabulous! (1) It has words . . .
(2) It has visuals . . .
(3) It has links to an MP3 audio clip and a website with a festival of other personal compositions . . .
(4) It is so big that it required two consecutive posts . . .
(5) It provides stellar information that includes enlightening clues to key aspects of NOTION 4 and digital music production which for the most part appear to have nearly nothing to do with the primary topic, and in fact were implied rather than mentioned explicitly, which fully satisfies what I call the "Abstruse Observation Rule" . . .
(6) It makes it possible to construct a patently surreal segue to Miley Cyrus, David Bisbal, Elvis Presley, Lady Gaga, and advanced vocal production . . . The clarinets sound very realistic--which typically is not an easy goal to achieve--and I like the textures and reverberation, as well . . .
One of the connections to NOTION 4 and digital music production is the Melodyne Editor (Celemony), which (a) can be used to do pitch-shifting and other advanced audio enhancing and producing techniques and (b) is included in a practical way in Studio One 2.6+ Professional via Melodyne Essentials, which can be upgraded to the two higher levels of the Melodyne Editor, thereby reducing the total cost of ownership for the Melodyne Editor . . . But perhaps the most significant connection involves providing an indisputable example of the difference in chromatic samples and non-chromatic samples, where for example the special editions of Vienna Symphonic Library have samples only for every whole step, while the full versions of Vienna Instruments are chromatically sampled where each and every note is sampled (half-step sampling rather than whole-step only sampling) . . .
By first transposing the original notes downward by a major third and then using the PitchProof Harmonizer|PitchShifter (Aegean Music) to move the pitch of the notes upward by a major third, which is done using an advanced algorithm-guided computation, this demonstrates the way non-sampled notes in non-chromatically sampled libraries are computed; and it also provides a clue to the practical range of such computations when they do not involve time-based or motion-based playing styles . . . 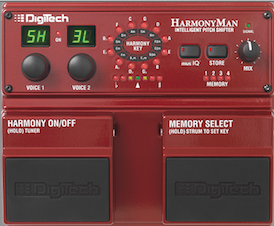 Curiously, the DigiTech Harmony Man stereo effects pedal does something similar, as does the DigiTech Whammy stereo effects pedal . . . 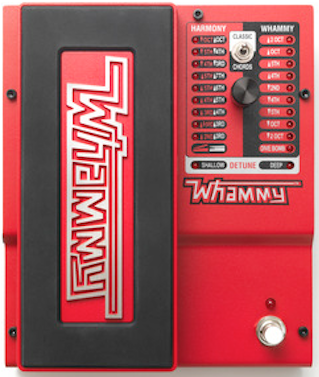 This started with the idea of creating the definitive example of everything that is possible to do with a Fender two-point synchronized tremolo "whammy" system and an elaborate set of advanced effects pedals, which included among other things two DigiTech Whammy pedals; a Budda Budwah pedal; and a Fulltone Tube Tape Echo unit, which is fabulous . . .
P. S. These various signal processors and effects units, including VST effects plug-ins, are used in the Pop and DISCO music universes for elaborate vocal production, as exemplified in the vocal production for "Who Owns My Heart" (Miley Cyrus), which based on the way I define and count tracks has somewhere in the range of 100 to 150 vocal tracks, including the virtual festival of male and female backup singers and all of the consonant overdubs that Miley Cyrus did . . .
Can this forum handle two Surfwhammy's? Don't you guys wish we could wake up every morning, walk out of our bedrooms, and find an orchestra waiting in our living room eager to play our next cue? JohnF wrote: Don't you guys wish we could wake up every morning, walk out of our bedrooms, and find an orchestra waiting in our living room eager to play our next cue? No, wait. Yes, you do. You, too, have been stricken...WITH ORECHESTRANITIS!